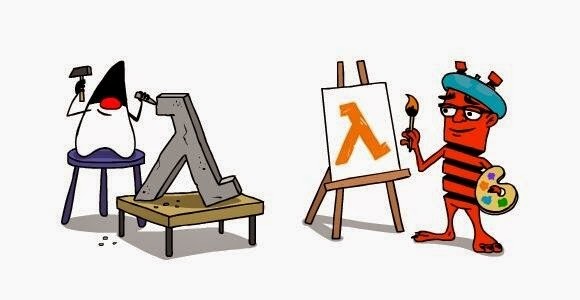 In this article, we try to understand the very basic use of Lambda expression with syntax and many examples. If you want to look what is Lambda and the basic idea behind it, I encourage to read this my article on the basic. I will try to cover all the basic use of Lambda expression in the tutorial. A lambda expression consists of a list of parameters and a body that are separated by an arrow (->). The list of parameters is declared the same way as the list of parameters for methods. The list of parameters is enclosed in parentheses, as is done for methods. The body of a lambda expression is a block of code enclosed in braces. 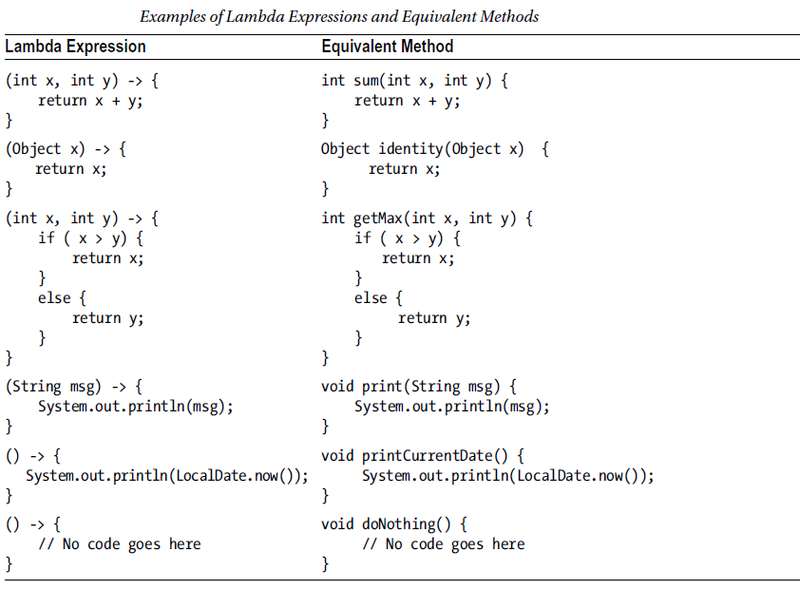 Like a method's body, the body of a lambda expression may declare local variables; use statements including break, continue, and return; throw exceptions, etc. Unlike a method, a lambda expression does not have four parts. A lambda expression does not have a throws clause. It is inferred from the context of its use and its body. Lambda expression are invoked via Function Interface. More detail on Function detail. 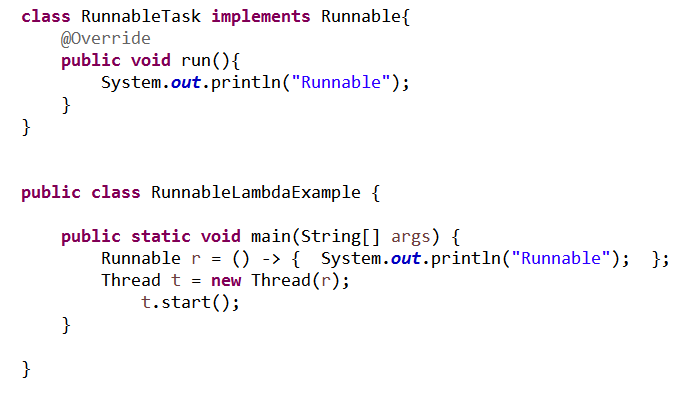 Runnable is an example of Function interface, (check Runnable Java 8 doc) so we can use Runnable interface in term of Lambda expression. 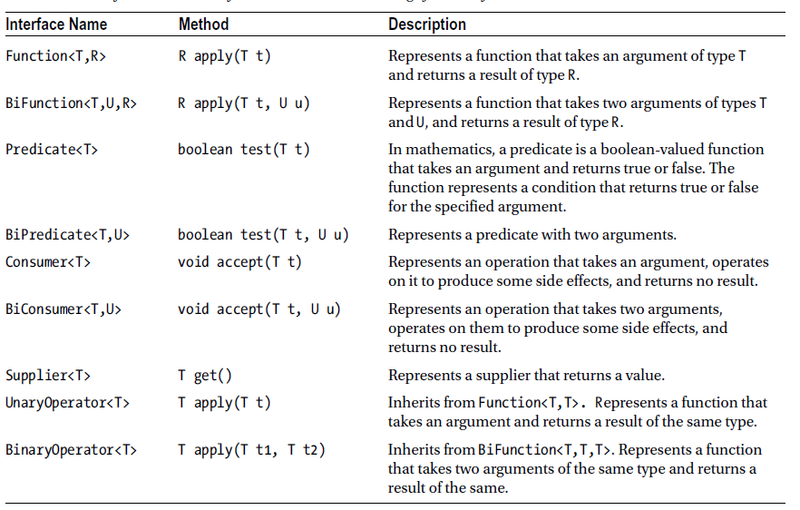 Following table contains some examples of lambda expressions and equivalent methods. I have given a suitable name to methods as you cannot have a method without a name in Java. 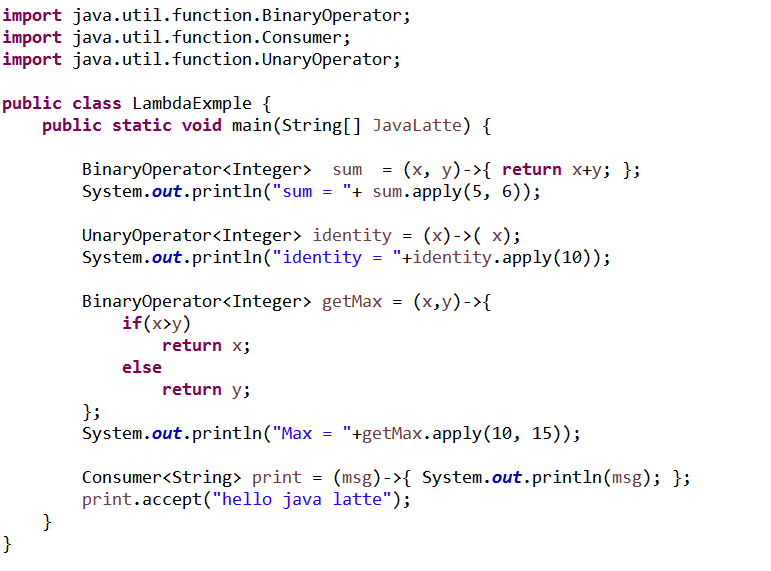 The compiler infers the return type of lambda expressions. Example : how to use above lambda expression with function interface. One of the goals of the lambda expression was to keep its syntax concise and let the compiler infer the details. The following sections discuss the shorthand syntax for declaring lambda expressions. // Omits parentheses, but not the parameter type, which is not allowed. When a block statement is executed the same way as a method’s body. A return statement or the end of the body returns the control to the caller of the lambda expression. // Uses a block statement. Takes two int parameters and returns their sum. // Uses an expression. Takes a two int parameters and returns their sum.